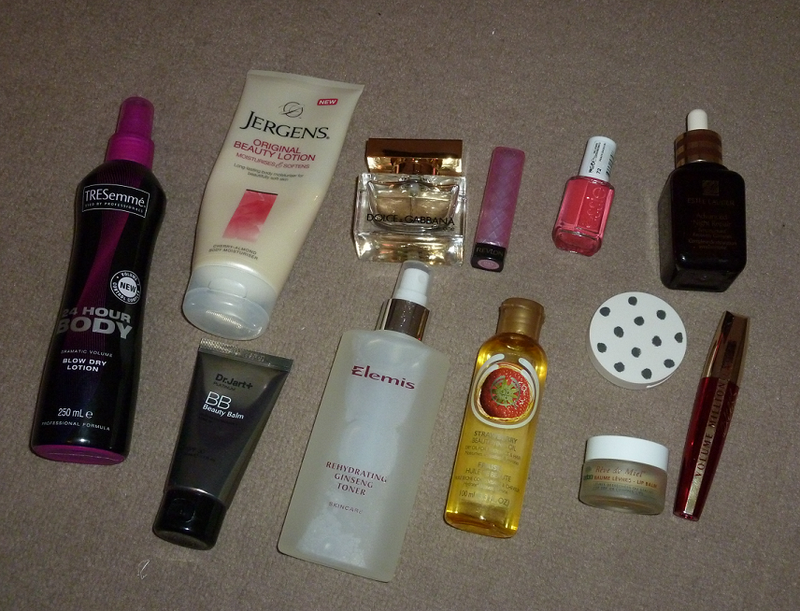 So here we are at New Year's Eve and it's time to share my favourite beauty products of 2012. Before I begin I just wanted to say I hope all of my lovely readers had a fabulous 2012 and I hope 2013 is even better! It was hard to whittle down my favourites but I've managed to come up with my top 12 and I discovered most of these this year. I've only picked one hair product as I tend to chop and change my hair products all of the time to find something better but this year I've loved the Tresemme 24 Hour Body Blow Dry Lotion. I have really fine hair that lacks volume but spraying this into freshly washed and towel dried hair before blow drying makes my hair look thicker and lifts my hair at the roots. It is slightly on the sticky side as you will notice if you accidentally spray it on your skin but it's worth it for the effect it gives. 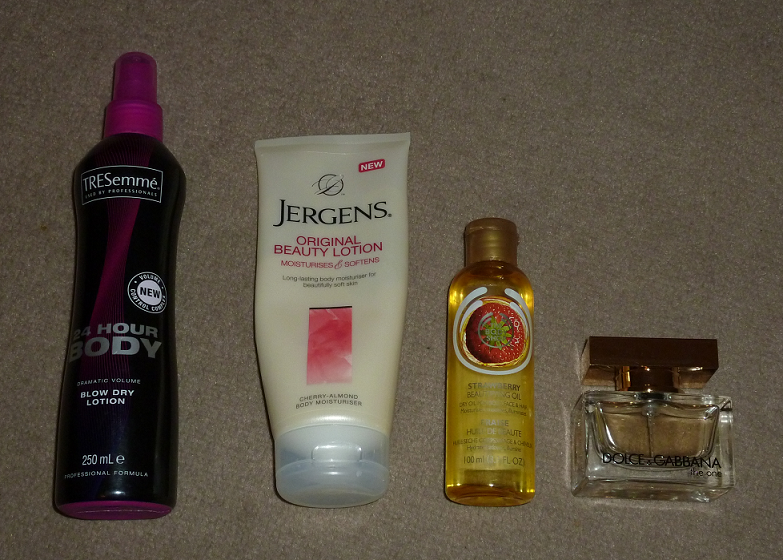 The body lotion I most enjoyed using this year is the Jergens Original Beauty Lotion*. This has the most gorgeous cherry almond scent and it provides long lasting moisturisation to the skin. I've also been loving The Body Shop's Strawberry Beautifying Oil in the Strawberry scent. This smells absolutely delicious and leaves your skin silky smooth but not greasy. A little goes a long way so one of these bottles lasts for ages too! I very rarely repurchase perfumes as I like to try different scents but this Dolce & Gabbana The One fragrance has been repurchased three times now! It's my most repurchased scent ever! I usually love very sweet fragrances but this one is more of a citrus based scent that is more grown up and sophisticated. I really enjoy wearing it and it's perfect for day or night. Speaking of repurchasing... my most repurchased toner is the Elemis toners. I buy either the Soothing Apricot Toner or this Rehydrating Ginseng Toner. This is my absolute must have toner (in either variety) ! They smell lovely, are nice and gentle due to their alcohol free formula, make my skin feel great and the spray bottle makes it so easy to use. I hate not having an Elemis toner in my supplies! One of my best discoveries this year has to be the Dr Jart+ Platinum Beauty Balm. This was my first beauty balm purchase as none of the ones I've swatched from other brands seemed light enough for my pale skin. Of the four types of Dr Jart+ beauty balm this is the lightest and it's a perfect match for my skin. I've swapped my slightly too dark foundation in favour of this as it provides a foundation like coverage in the perfect shade. If you want to see photos of my skin with and without it, see here. 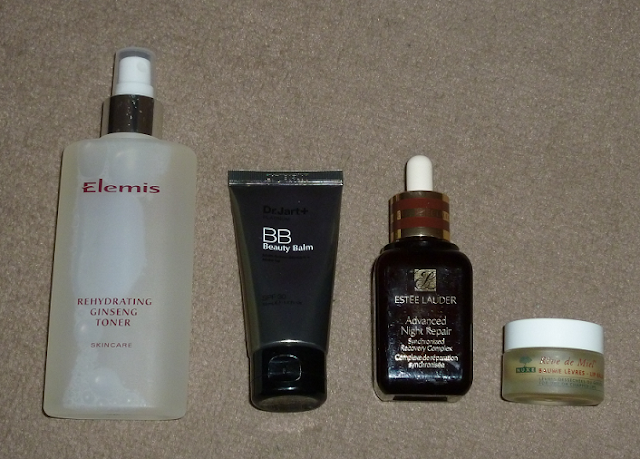 Estee Lauder Advanced Night Repair Serum was one of my most expensive purchases of 2012 but I am so glad I took the plunge. This serum provides lots of benefits to my skin. It not only hydrates it as I sleep, it also diminishes redness as well as reducing my spots. It's so good and I don't want it to run out as I dread having to replace it! Hopefully I'll get some more vouchers which is how I ended up buying it in the first place! During my trip to Paris in the Spring I picked up the Nuxe Reve de Miel Lip Balm. I gave in to the hype on this one but it does wonders for my lips. Its a really thick balm that will sort out the driest of lips returning them to their natural state and it smells super nice too! It smells like oranges, mmmm! My pot is lasting ages too. Revlon have brought out some great products in 2012, their Lip Butters and Kissable Balm Stains in particular. Although I love all of ones that I own, my most favourite is the Lip Butter in the shade Cotton Candy. 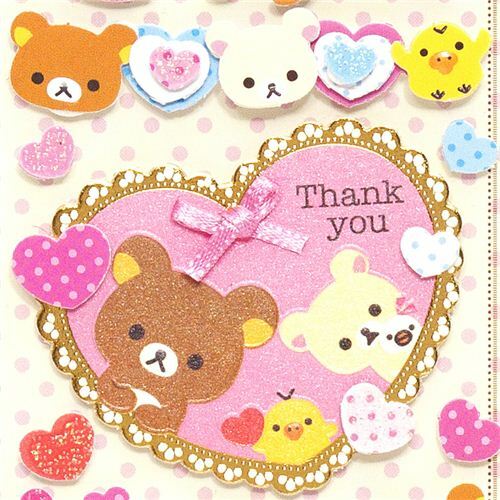 It's a gorgeous shimmery pink colour that looks really cute. It looks nice and glossy on the lips and the colour is suitable for day or night. It's easy to apply this without a mirror too. I used this on my recent anniversary night out to create a pretty, glowing look. Essie nail polishes have been a big favourite of mine this year due to launching their diffusion line in Boots and Superdrug stores. This has made the polishes more accessible and affordable. Maybe a little too tempting as well! I can't go to Boots without having a look at the Essie stand. I would love to own all of the colours! My favourite and most worn shade of this year is Peach Daiquiri. You can see my full collection here. 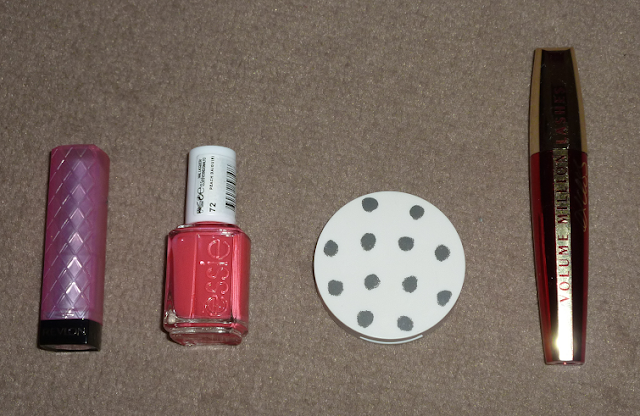 Topshop makeup has been really popular this year and I love their nail polishes, cream blushes and lipsticks. My favourite has been the cream blushes though! I have the shades Head Over Heels and Flush which I love equally and they are so easy to apply and blend. I love the nice pop of colour these add to the cheeks. I think I've left the best until last as this is actually my overall favourite product of 2012. It's the L'Oreal Volume Million Lashes Excess mascara in black. This is an amazing mascara that separates, lengthens and volumises lashes. The brush is so easy to use and it coats every single lash. There isn't too much more I can say about this but it just does everything I want in a mascara and it's amazing! I have a post on it here if you want to see the effect on my lashes. I hope you've enjoyed reading my favourites post and I'd love to hear about your favourites too so please comment below and feel free to add your blog/YouTube links as well. I appreciate all of the support you have given me in 2012 on my blog, Twitter, Instagram and Facebook. Thank you so much for all your lovely comments and messages, I appreciate each and every one of them. Please let me know if there is anything you would like to see in 2013! Great favourites! I've finally bought the ANR after winning a gift card from Debenhams, so I'm excited to see how this helps my skin. I looove that Essie colour! So pretty and girly. I might need to invest in it, or something with a simlar colour at least! I still haven't tried the Volume Million Excess I won as I'm waiting for my normal one to finish, but I can't wait - I can't rave about the normal one enough so excited that this one is probably even better. I'm so eager to get that Nuxe lip balm as I keep hearing how good it is, and nothing I've ever tried has done the job. I use Dr Jart Water Fuse and I love it. Hated it at first but noticed it did actually adjust well, so love it now! Revlon Lip Butters and Essie polishes are also favourites of mine!